I. Prelude: What is a revolution? How did Martial Law Happen? In my blog entry, “Thoughts on stillborn revolutions,” I put forward Apolinario Mabini’s definition of a revolution, and proposed other possible definitions. From writers such as the Leon Ma. Guerrero and Lew Gleeck come some thoughts on our political culture, and how martial law was made possible because of it. An interesting concept introduced by historian Mina Roces is that of “malakas” and “mahina,” and how the public reacts to perceptions of one or the other. In 2010 I shared this reflection on power: its attractions, and temptations. What was it like to live under martial law? Writer Charlson Ong published his reflections in 1999; blogger Noami Dado did so, more recently. 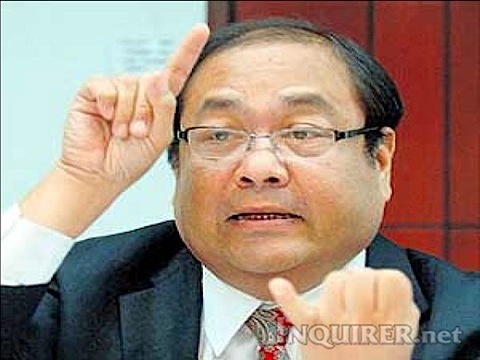 The late Teodoro M. Locsin on what “If”: if Ninoy hadn’t died, what then? 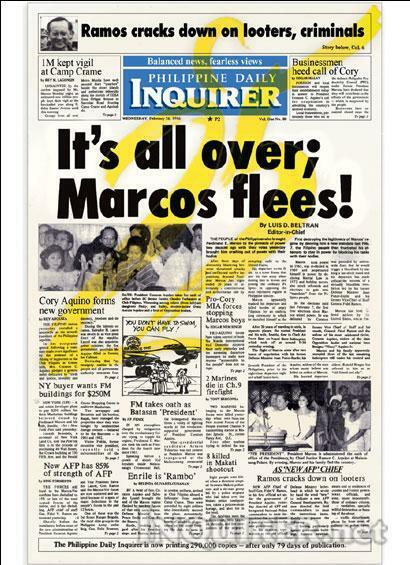 This article gives additional insight to Locsin’s reflection: how friends and foes of Marcos sought to convince him to relinquish power voluntarily. 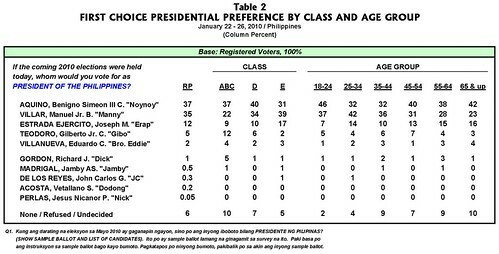 In 1999, I penned this estimation of Cory Aquino and what she represented: a unique willingness to relinquish power. In a more recent article, I looked back on the challenges Cory Aquino faced, and how, as time recedes, what it took to survive the challenges to her rule becomes more difficult for post-Edsa Filipinos to appreciate. 26yrs ago today, Marcos was pleading with Blas Ople to engage with his Soviet contacts for a possible Marcos-USSR alliance. San Juan Gossip Mills Outlet: Where Were You? In a four-part series, Leah Navarro recounted her Edsa experience, from the moment they heard of Enrile and Ramos’ revolt, to the flight into exile of the Marcoses. In the immediate aftermath of Edsa, the Marcoses and their loyalists tried to resist; and elements of the military would try to seize power. But in the end, there would a revolutionary government quickly giving way to a constitutional one. 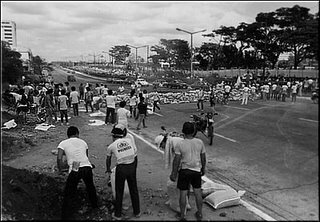 EDSA Stories | Understanding and learning from the EDSA events. 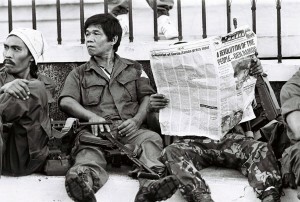 The military played a major role in Edsa. Ever since, the military as an institution has faced the temptation and the challenge, of playing a role in resolving crises. Timothy Garton Ash proposed that peaceful, People Power revolutions were Velvet Revolutions, and posed their own dilemmas because of the manner in which power changed hands. I offered a reflection, in turn, on what he wrote and the promise offered by People Power. 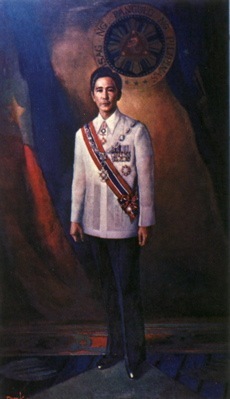 When Adrian Cristobal, an intellectual who stayed loyal to the Marcoses to the end of his life, died, I proposed that the enduring legacy of the New Society –the ideological justification for martial law– was the idea that society can be recreated; and that all sides have, to a certain extent, shared the assumptions on which the Marcos’ ideology was put forward. We forget the Marcoses and those representing their approach to governance, very nearly accomplished a restoration in the first post-Edsa presidential election. In 1992, if Imelda Marcos hadn’t split the loyalist vote, it’s entirely possible Eduardo Cojuangco Jr. could’ve been elected president. Since then, I argued in a two-part series that the country has wrestled with a presidential system incapable of producing the basic requirement for its validity and effectivity: an electoral majority. 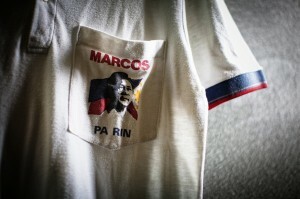 On the eve of the 2010 elections, I pointed out that the former political allies of President Marcos had attempted to achieve a political rehabilitation after being deposed in the Edsa Revolution; and that the 2010 elections could represent a repudiation of their efforts. As it turned out, this took place. Time then, is running out, for these people. 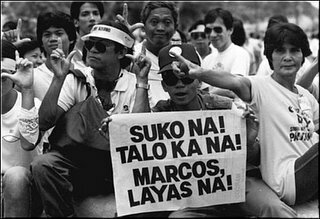 Beyond those who were part of the Marcos apparatus, there is the generation that was molded by growing up during the Marcos Era. To my mind, the most interesting example of this generation is Senator Francis Escudero. But the march of generations continues. If the Marcos or Martial Law babies are now at the point of being the main players in politics, in turn their success or failure is dependent on the generation that can be called Edsa Babies –or even Arroyo Babies. How we vote, and the results of our elections, is something I tackled, too. There were two People Powers in 2001, one succeeded, the other failed. In this entry, I looked at a Polish journalist’s description of two kinds of revolution: by siege and by assault. 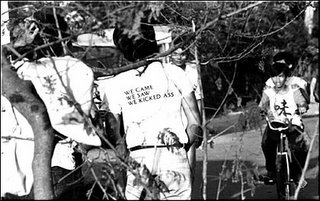 Was 1986 a revolution by siege, and was 2001 a revolution by assault? In the end, what Marcos, Edsa, everything represents is a cautionary tale on power and the public. Without EDSA, after that man died, his wife or his generals would have exercised that absolute yet legal power. 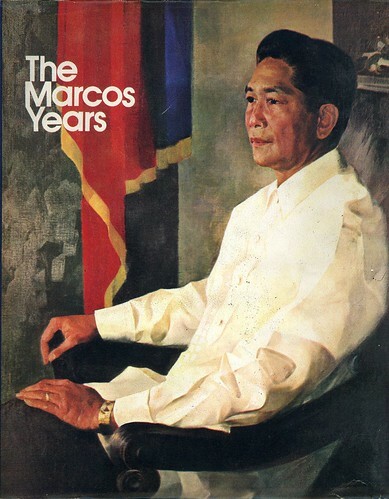 What lessons did our political leaders take away from the manner in which Marcos fell? The first myth to dispose of is that Marcos stayed the hand of the military which wanted to massacre the people at Edsa. In fact, he ordered an all-out attack, but it failed. Since then, beleaguered leaders have tried to hold on at all costs, none more succesfully than Gloria Macapagal-Arroyo.